Advanced Ultrasonic Inspection techniques are being increasingly used now for the assessment of the true condition of industrial plant. Due to the increased Probability of Detection (POD) these techniques can in many cases be used to replace the conventional, statutory inspections. More and more, these techniques are used in a non-intrusive manner, thereby increasing the availability of the plant for production. Risk Based Inspection and Reliability Centred Maintenance are concepts that make extensive use of Non Destructive Examination (NDE) results. The accuracy of the different parameters in such, often probabilistic methods in combination with fracture mechanics, determines the reliability of the results. The more accurate the inspection results, the more reliable will the remaining life time and the Safety Hazard calculations be. This paper will discuss case histories in power generation, construction, offshore and (petro-)chemical industries where, because of the high accuracy of sizing, advanced techniques such as Time Of Flight Diffraction (TOFD) and C-scan mapping were used to establish the true condition of plant and to calculate its remaining safe life period. These results form the basis in cases for inspection interval and lifetime extensions. Examples will include inspections of steamdrums, corrosion and erosion in gas plants, root corrosion in flow lines as well as HIC and HHA in vessels and piping. In each case, the cost effectiveness can be demonstrated. As the useful lifetime of plant begins when the plant is newly built, the role of baseline inspection of new plants will be discussed. During the whole lifecycle plant is inspected at regular intervals, in general to fulfil the demands by the certifying authority, the well known process of certification. In many cases, when these inspections are carried out during the inspection and maintenance intervals of plant, the conclusion of these inspections is that no action is required, in other words, the condition of the equipment is fit for service. In such a case, it seems a waste to go through the process of opening a vessel, cleaning the inside and/or take out internals to facilitate an inspection at the risk of causing damage, conclude that nothing is wrong, close the equipment up, and at the end of the shutdown take into service again. Sometimes it also takes quite a lot of effort to bring the equipment back to operating conditions, without leaking fittings and gaskets. In some cases however, the internal inspection reveals defects which render the equipment unfit for service. In such a case it is than necessary to repair or replace, before the equipment can be taken into service again, which can lead to extended shutdown periods. There are other ways of looking at periodic inspections, by asking ourselves why we do these inspections. Surely the main reasons must lie in assessing the probability that the plant can be operated safely with little risk of unplanned shutdowns until the next planned shutdown, i.e. continued safe operation of plant with optimised availability and productivity. In many cases this can be achieved without going through the costly and time-consuming mechanical works together with the required safety precautions involved for entering vessels, by using non intrusive inspections (NII). There are two ways of applying non intrusive inspection. One is the application of NII during operation of the equipment. The major advantage here is of course that the inspection can take place long before the shutdown, where the pressures of working in a confined area and limited time are less predominant. The results of such inspections can be used to optimise the planning of the shutdown, by directing effort where this is needed. If the findings lead to the conclusion that parts need to be replaced, than these can in many cases be prefabricated to minimise the time needed for replacing during the shutdown. The findings could also be used to underpin risk based inspection planning. The application of NII during operation is not always possible, due to by example higher operating temperatures than at which the technique can work or inaccessibility for safety or other reasons. Another way of applying NII is during the shutdown. Although in this case we do not have the advantage of knowing the true condition of equipment before the shutdown, the advantage remains that the equipment can remain closed. As no mechanical preparation work is needed to open the vessel, clean it and close it again, this can be a considerable saving in itself. AEA Sonomatic have developed imaging techniques such as Seescan (Micromap) that can give the engineer easy to understand results which can not only give him accurate condition of his plant but sometimes evidence showing the cause of any corrosion or erosion. These techniques are based on simple ultrasonic methods that, when used in conjunction with a digital flaw detector and data presentation system can display the inner surface of a pressure vessel, or pipework in a colour representation of actual thickness. For the assessment of the condition of welds, reliable and accurate techniques are such as mechanised ultrasonic Pulse Echo examination and Time of Flight Diffraction (TOFD). Less then a decade ago these systems could be called expensive, cumbersome and inflexible but in the present time of ever faster computers and data acquisition systems combined with the increasing acceptance of these systems in specifications, these prejudices, certainly for TOFD can no longer be held up. Positional information is observed and recorded by a video camera which tracks a transducer via a small lamp mounted on top of the transducer. By using the X-Y pixel matrix of the video image as an invisible grid pattern on the specimen, the computer in Seescan constantly reviews the video image looking for the bright spot generated by the lamp. This bright spot is given a X-Y co-ordinate and shown on the real time video display. Simultaneously Seescan reviews a synchronised ultrasonic signal and converts the ultrasonic reading (thickness measurement) to an assigned colour. All this information is displayed on the video monitor as a composite colour image of the area examined. The interval between individual ultrasonic measurements dictates the resolution of the resultant image. For generalised erosion without any sudden changes in thickness, a 10mm x 10mm resolution may be adequate, but to identify and analyse specific forms of complex types of corrosion a 1mm x 1mm interval may be more appropriate. High resolution ultrasonic mapping can enable corrosion type to be identified and in certain cases this information can be used to underpin a remedial strategy to inhibit the rate of material loss. A further benefit of corrosion mapping is the ability to store digitised ultrasonic waveforms. This enables a greater flexibility in off-line imaging than where only thickness measurements are concerned. The procedure followed is to create a composite image of the area of concern by assembling adjacent corrosion images to give an overview of the inspected area, then select worst case or representative sections for detailed analysis. Individual B-scans are then analysed to study the influence of the reflector's morphology on the ultrasonic beam. This can give a great deal of information on the mechanisms taking place within the material itself and at the inner surface. This capability is useful for example, in discrimination between inclusions, hydrogen induced cracking and corrosion pits and for assessing whether hydrogen induced cracks are 'rough-surfaced' or inter-linked by step-wise cracking. Although these methods are now being routinely used as an alternative to the traditional visual survey, there are also times when the opposite logic applies e.g. examine vessels from inside as an alternative to removing expensive lagging. In many instances inspection from the outside of pressure vessels can be carried out whilst the system is in service, therefore reducing shutdown time by carrying out examinations on line, cryogenically or up to 350°C. Development work is ongoing to increase the upper figure to the 500°C range. An internal visual inspection provides a certain amount of essentially qualitative information, but it has limitations of factors such as access and reliability. Equally, corrosion mapping has a different set of access limitations although reliability is improved as a hard copy record is generated which demonstrates coverage and is open to interpretation by multiple assessors if necessary. The data generated with ultrasonic imaging systems is quantitative. This aspect is of importance for situations where widespread pitting or general thinning are encountered. In these cases it can be very difficult to identify the thinnest location visually, but composite corrosion maps can indicate this at a glance. One of the most versatile and accurate inspection techniques used by AEA Sonomatic is Time of Flight Diffraction (TOFD), an ultrasonic technique for weld inspection. On both sides of the weld an ultrasonic probe is positioned.One acts as an emitter of ultrasound, the other as a receiver. When the probes are moved parallel along the weld, the resultant waveforms are digitised, stored on hard-disk and displayed on the video-screen as a grey scale image. The longitudinal sound beam can encounter obstacles on its path, which cause reflected and diffracted signals.The image build up is in effect a through sectional view of the weld examined and can be used for accurate sizing and monitoring of indications. During a project executed at a gas treatment centre, a Risk Based Approach was used, to justify the continued operation over its design life, using Non Intrusive corrosion mapping of vessels and weld root corrosion surveys of piping, during a period some months before the planned shutdown. The corrosion mapping involved the inspection of areas on vessels indicated by the RBI study. The results of the measurements indicated that some areas of concern were present at some of the vessels. This led to the opening of only those vessels during the shutdown, instead of the prescribed visual internal inspection which would normally have taken place. On the inspection of the flowlines some corrosion areas where found to have a too severe influence on the remnant life of the plant and therefore too severe to be left unrepaired during the envisaged longer operation time of the plant. A repair plan was set up for the indicated welds during the shutdown. As a result of the above inspections during operation, the repair plan could be set up resulting in an optimised shutdown period involving less than one week of work, which in the normal case would have taken nearly four weeks, not counting possible delays due to materials not at hand at short notice. A second example of savings made by using Non Intrusive Inspection in lieu of intrusive, is a case where inside a steam drum, during a regular shutdown a cracklike indication was found. The crack was ground away during the shutdown period, but rewelding the removed material, including post weld heat treatment (PWHT) would have extended the shutdown with several weeks. Following measurements of the remaining wall thickness, a fracture mechanics calculation was carried out. The outcome of this exercise was that, provided no new cracks would grow from the excavated area, the steamdrum could be operated safely until the next scheduled outage. During this outage the repair including PWHT could be planned in parallel to other work, which would then not impact upon the length of the outage. The problem that remained was to inspect periodically until the planned outage for any crack initiation. One possibility was a two-monthly magnetic particle inspection (mpi) at the inner surface of the excavated area. For this option the unit would have to be taken off line, and left to cool down. Then the vessel would be opened, cleaned out and inspected, whereafter it would be taken into service again. The actual inspection, taking no more than a few hours would therefore lead to a production loss of around three days, at a cost of some US$ 75000 per inspection. The alternative proposed was to use the Time Of Flight Diffraction technique, scanning from the outside of the vessel at operating temperature, around 200°C. A validation exercise was set up under Stoomwezen, whereby a test block was designed and built, representing the actual situation. Small planar flaws where introduced at critical places in the block using spark erosion, to resemble crack initiation points. First, it was proven that these could be picked up unambiguously at ambient temperature by TOFD. Thereafter, the exercise was repeated at the operating temperature of the vessel, which showed that the measurements where reproducible, even under these conditions. The method was then used in practice, the first time in parallel to internal mpi, whereby the TOFD inspection was done once before shutdown at operating temperature, once at ambient temperature and once directly after start up. The consecutive measurements proved to be perfectly reproducible and showed no crack initiation, confirmed by the internal mpi inspection. The advantages where clear: each TOFD inspection in lieu of a mpi with the associated shutdown for inspection was a major cost saving, whilst safety of operation was justified. An additional advantage of this approach was that the vessel remained at the same temperature throughout the whole period until the planned repair shutdown, which avoided temperature gradients which could influence crack initiation. A third case, is an ongoing project where at an offshore platform, corrosion in the root of circumferential welds in flowlines was present. This phenomenon can be detected during shutdowns by an internal visual inspection, mainly in the flange to pipe welds which are relatively easy accessible. For locations without access alternatives are manual pulse echo and radiographic inspection. The reliability of these techniques is relatively low and dependant upon the actual physical appearance of the corrosion and contents of the flowline. Also, no quantitative data on remaining ligament or defect height is produced to enable remaining life time calculations. Time Of Flight Diffraction was proposed as an alternative to the platform owner to be able to detect and quantify the root corrosion. A first blind trial was set up, whereby a pipe sample was examined with TOFD, and later the reported remaining ligaments where compared with the mechanically measured values. Based upon this first attempt to validate the technique, the work was started and many welds where examined to establish the extent of the damage on the platform. As opposed to the earlier applied conventional techniques it became clear very quickly that TOFD had a very high detection capability and accuracy of sizing, which led to increased confidence in the technique. The necessary repairs were carried out and the platform was taken in operation again. In order to minimise the chances of another unplanned shutdown a monitoring programme was set up, in close collaboration between the platform owner, AEA Sonomatic and fracture mechanics specialists. Fracture mechanics calculations where carried out, providing minimum ligament values for continued safe operation between planned shutdowns. In parallel, a validation programme was set up at the platform owners' laboratories to establish the true accuracy of the AEA Sonomatic TOFD system. A large sample of welds was examined with TOFD, and afterwards cut open. The root corrosion depths where then mechanically measured using an automated system, whereafter the remaining ligaments where calculated from the actual wall thicknesses. The comparison of the mechanical measurements with the TOFD values was done at set intervals around the circumference. A statistical evaluation of the results showed, that the mean measuring difference between TOFD and mechanical measurements was +0.2mm. The 95% confidence level was calculated at 0.7 mm. On comparing the results with measurements previously obtained during an offshore inspection, the mean error was even smaller than the 0.2 mm, which proves the excellent reproducibility. The monitoring programme is now almost fully administered automatically. The TOFD measurements are transferred into a calculation programme, which graphically shows per weld the actually measured and minimum required remaining ligament. In graphical representation, the corrosion rate per weld is produced. Together these lead to a calculated remaining safe operation life per weld, which is the perfect tool for maintenance and repair shutdown planning. Also here obvious advantages are present: long before the shutdown it is known which welds should be repaired, or which parts of line should be completely replaced. Such spools can than be prefabricated before the shutdown and placed during an optimised shutdown window, leading to considerable time savings during the outage. In the calculation of the remaining lifetime another important factor needs to be known, which is the stress present in the material, primarily near the welds. 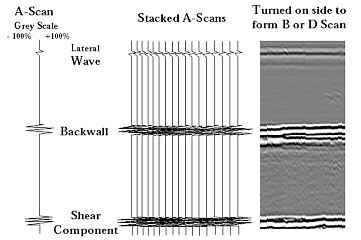 Since some time AEA Sonomatic has a system available called MAPS, which has the capability of measuring stresses in materials in a non-destructive way. The equipment has been developed by AEA Technology at Culham (formerly Harwell). Together with the accurately determined defects sizes, this can be used to improve the accuracy of the remaining lifetime calculations, by using the actual stress values, rather then the values derived from design parameters. For the determination of the remaining lifetime, it is important to realise that all measurements have a spread on the accuracy. The accuracy of the determination of the remaining lifetime in the previously described program to measure corrosion in the root of flowline welds, depends greatly upon the accuracy of the measurements. As in most cases inspection intervals and remaining lifetime are based upon the "worst case", decreasing the spread in the measurements could lead to significantly longer intervals and lifetimes. In view of the foregoing, subsequent monitoring measurements lead to more datapoints, which inevitably lead to a more reliable remaining life calculation. As a minimum, two measurements at different times are possible to start the life calculation. By going off design thicknesses on drawings as an example, one could suggest that already after the first inspection these calculations can start. However, design values are not necessarily actual starting values... By starting the monitoring with a base line survey before a component is taken into service, based upon a risk analysis of the plant, a reliable starting point can be established. TOFD is now more and more accepted as an alternative to radiography for pre-service inspection, and can at the same time provide this base line for the monitoring programme, adding significant value and meaning to this inspection. AEA Sonomatic has introduced an in-house TOFD qualification system in 1988. All operators are trained and qualified in accordance with this system, which is based upon ASNT-TC-1a, modified for TOFD. During 1996 and 1997, on behalf of AEA Technology's NDT group, the inspection validation centre (IVC) has developed an improved training- and certification system for TOFD, which is based on independant examination and certification. In conclusion, the use of the Non Intrusive Inspection techniques described, lead to significant cost savings through optimsed shutdown planning. Albeit that in some cases the inspection price may be higher than the conventional inspections such as internal visual or mpi inspections, the total associated cost for applying these techniques is in many cases much larger than for the advanced techniques. In addition, the quantitative results that can be obtained the modern NII techniques in combination with RBI planning, stress measurements and life time calculations, lead to optimised inspection and maintenance intervals, resulting in large cost savings through increased plant availability.